How much line can it hold? How lite is the reel? How do you control the fish? What color should you go for? How many spools do you need? It is important that when matching up your fly rod line and reel you stick to the manufacturers stamped sizing. As in the previous post we are working with a 10ft 6-7 weight rod so we want to match the reel to that. Why is this important? Well to have our rod setup perform correctly we want it to be balanced. This means if you hold the rod by the handle fully loaded with reel and line it should only slightly dip forward in your hand in fact if you can get it to sit balanced so much the better. The reason for this is it takes less effort to pull the fly line from the water to make a fly fishing cast and less effort means less energy required to perform the cast and the longer you can fish without fatigue. If you are only going to fish for an hour then this is not that important but if you are going on a dream fly fishing destination holiday you want to get every second out of the trip then you need balanced light gear to provide that. If your rod dips tip down too heavily then it will take more effort to lift the line and so hinder your performance and increase fatigue. If it lifts too quickly ie the reel is too heavy for the rod then you will need to keep your hand pointing down all the time to avoid this lift and again will fatigue you throughout the day. For a beginner this may not be that important if the rod is slightly off balance but as you gain experience and try out fellow fly anglers gear you will come to appreciate a properly balanced kit. The option to have this comes at a price though and its working out what is the best you can budget for. With the size rating for a fly fishing setup manufacturers will allow enough room on their fly reels to accommodate a fly line of the correct rating and several hundred yards of backing. There needs to be enough room to allow both to be wound up completely for storage without getting trapped in the reel. A small trout set up will only require a hundred feet or so backing to allow running as they are not large enough to strip a lot of line from your reel. However if fishing for larger species then amble backing is required to allow for this. So it is important to decide before hand which species you are targeting with this setup. Some newbie’s make the mistake of overloading the fly reel with backing and not leaving enough room for the fly line leaving it tight to wind which is a disaster if you hook a good fish. Recommended process to load the fly reel can be found here. There are several options available today from cheap graphite to expensive alloys of light metal like titanium and aluminium. There is a remarkable price increase from the cheap and cheerful to the expensive brands. For a beginner fly fishing angler I would recommend the most you can afford for the rod and line and only a fraction on the reel. The reel is after all only a container for the fly line it doesn’t affect the overall cast or fishing technique. That being said it does feel nice to fish with a light aluminium fly reel which is nicely matched to the fly rod and line making the whole outfit lite in the hand. Tension control is used to tighten down on a running fish to help tire it out while playing it. The tension can be set before hand and re-adjusted as needed during the fight. So the best option is one with a large knob to turn easily with one hand so if the need arises during the fight you can easily do this without too much of a problem. The last thing you need it to struggle to release the tension when a fish wants to run to find you can’t get it done quickly enough to only loose the fish. Not a good feeling. 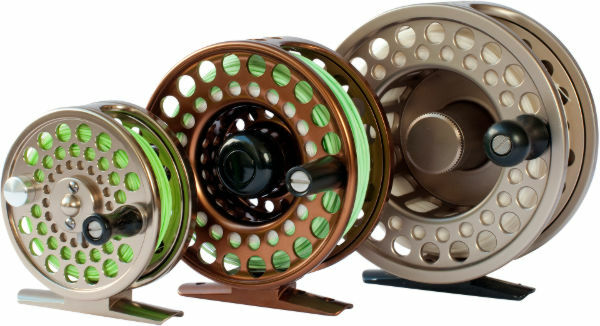 Fly fishing reels come in all sorts of colors anything from plain black to bright luminous colors. This is mostly a personal choice but I would like to point out if planning to target easily spooked fish then you would be better going for a neutral color so not to push them away from you. When salt water fly fishing off a boat in deep water this is not so important and this is where we find most of the really brightly colored and interesting designed reels. Some of these are a work of art never mind a tool for fishing. Companies like Able and Timor are among the best colored reels. Color has no real affect on the performance of the real other than the effect of spooking skidish fish. There are many fly fishing reels on the market that come with a spare spool or indeed several options that come with a complete set of spools. These cartridge reels are a good buy for newbie fly fishing anglers as the ability to add different density fly lines to your kit is provided a lot cheaper than having to buy many aluminium spare spools. The cartridge reels offer spare spools at about $10 each which is a great option with those on low budgets. We will discuss the need for different densities in another post but bear in mind fish swim at different depths and the ability to get your fly to those fish is all important to your catch returns. So in summing up if I was a beginner going for our 10ft fly rod which is weighted 6-7 and targeting trout of 2-3lbs in weight then I would require a 6-7 weighted large arbor reel with the capacity to hold 100ft of backing plus 100ft fly line. I would go for a cartridge set up with 3-4 spools. This I would then load with a weight forward full floating fly line plus an intermediate, a slow sinker and a medium sinker. This would enable me to fish many different waters and help improve my catch rate. I hope you found this post useful and would welcome any comments or questions in the comment section. Hi Ryan, it is standard practice to use a 9ft rod of 5 rating and as light as possible as stretching the arm out for long periods can fatigue you very quickly when using a heavy rod. Some have moved to lighter rated rods also even down as far as a 2 weight however it takes time to develop your technique and maybe its best to start with the 9ft #5 weight. Its best using a double taper fly line and a leader of 9ft in length. Another great post Mark. I was looking forward to the next installment on this series. Can I just clarify something with you. Is my reading of the above correct in that you have different types or densities of fly lines, I assume for different types of fish. Makes sense if you’re fishing for a bigger or smaller fish. I know you said you’d look at it in another post but briefly, what are the range of line densities available for a fly rod? Also, how big can you go, in that is there an accepted limit to a size of fish a rod can be used for i.e. the fish is just too big to handle by hand. What is that limit? Hey Colm I will clarify this better in the next post but here is a brief overview. Line density is to do with the way the line behaves in the water not the size or strength of it. There are many densities starting from full floating line, intermediate which just sits below the surface and sinks ever so slowly to slow, medium, fast and super fast sinking lines. These enable the fly fishing angler to use the appropriate line to get their flies to the correct depth of water to the feeding fish. It is recommended to carry a few different densities in your kit so when the situation changes you have the ability to fish on rather than pack up and go home. There are other options to getting the line to sink like adding heavy lead flies etc but having the correct line makes your flies behave more naturally and so helps your catch rate which is the end game. As for big fish there are specialized lines for specific species, like Tarpon, Pike, Salmon etc. Most fly lines can put up with a large fish but what their particular breaking strains are is different to each manufacturer. Thanks for that Mark. That’s a really great explanation for a newbie like myself 🙂 I’m looking forward to the more detailed post on this! I imagine it must take quite a while to get to know what works given the weather, the type of fish you’re fishing for, the environment you’re fishing in, etc. So how would you judge the feeding level of the fish to know what density to use? Is it a question of trial and error to a degree. that is, try a certain density and watch it to see how it fairs. If nothings biting, change to another reel density and so on till you get it till it’s looking good? Very good question Colm, there are several ways depending on target species, water type and so on but mostly sight is the best method, especially in clear waters. For example if you arrive at a fishery the usual first option is to try the full floating or intermediate fly line targeting fish at the surface of the water column. If you are there for a while (half an hour or so) and don’t see any trout break the surface or get any takes then you would assume they are feeding or swimming in lower water. That would be the first change to the line to take it down a bit further maybe using a slow to medium sinker. Then again after a while of non action you would change to a faster sinker to take if further down. Now this is just a general guide there are so many variables to fly fishing to increase takes including fly pattern, leader length and type, retrieve speed and technique etc so its not always down to trying different depths. Thanks Mark, once again you explain it in simple terms for a newbie like me to understand. Thanks for the links to the other posts, they’ll be a great help to me! Thanks Mark, I will do. I’m looking forward to more installments in the series!